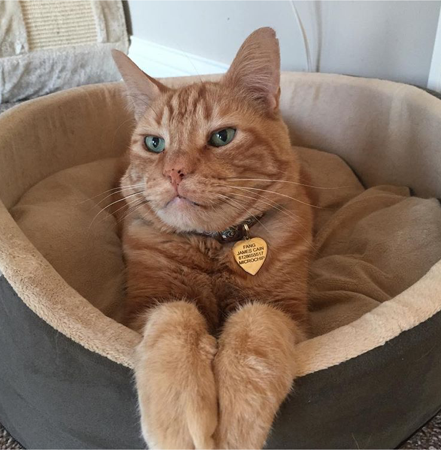 A long time client adopted Fang, an orange tabby cat from a shelter. When she brought Fang in for a checkup, Dr. Meaghan noticed that Fang had some broken teeth. She suggested surgery to remove the teeth and alleviate pain. Fang’s mom agreed with the doctor’s course of treatment. Fang’s new mom also mentioned that Fang seemed to sneeze a lot. She had been told that Fang’s sneezing was caused by seasonal allergies. When Fang came in for surgery, Dr. Pete Lukasik did a complete oral exam while Fang was asleep. When digital x-rays of the mouth were taken to assess conditions under the gum line, our team found 2 surprises. First, poor Fang had exposed root tips under his gums, which is extremely painful. This may have happened during a dental procedure earlier in his life. That is why the extensive training Dr. Lukasik and his team have gone through is so important. The second surprise Dr. Pete Lukasik discovered, was Fang had buckshot in his jaw and nasal cavity. Dr. Lukasik determined that Fang must have been shot in the face at a young age and buckshot was the cause of the sneezing. After extensive surgery, Dr. Lukasik and his team removed the broken teeth seen in the exam room, repaired the exposed roots under the gums, and removed the buckshot from Fang’s nasal cavity. We’d like to thank Fang’s new family for taking such good care of him, and giving him a new lease on life. As professionals who are dedicated to helping our patients, it is extremely rewarding when we can improve their quality of life.